Fresh pineapple is highly beneficial for the skin as it contains alpha-hydroxy acids that help slow down the ageing of skin. This fruit is rich in vitamin A, vitamin B1, vitamin B6, vitamin C, and various minerals. 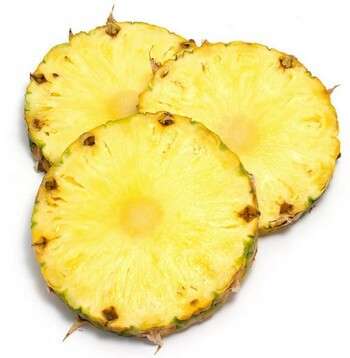 In addition, it has a proteolytic enzyme bromelain with anti-inflammatory properties. It prevents and reduces age spots and wrinkles. Plus, it makes the skin firm by increasing collagen production. Thus, you can apply pineapple juice on your face and neck for a few minutes and then rinse it off to get younger looking skin. Moreover, you can rub a crushed pineapple slice on your skin as a scrub to remove dead skin cells as it has a mild exfoliating effect. • Blend four pieces of pineapple and two tablespoons of coconut milk together in a blender. Spread this paste on your skin and leave for about 10 minutes. Wash it off with warm water, followed by a final cold water rinse to get beautiful, glowing skin. • Applying a combination of pineapple juice and carrot juice on your face and rinsing it off with lukewarm water after 15-20 minutes gives a healthy glow to your skin and fades dark spots. • Whisk an egg and mix two tablespoons of fresh juice extracted from a pineapple. Immerse your nails in this solution for five minutes and rinse it off with lukewarm water. Apply a hand cream afterwards. In case you have dry skin, use coconut oil. • Blend four large chunks of pineapple, three tablespoons of extra virgin olive oil, and one tablespoon of honey in a blender. Regularly apply this simple home remedy on your face and neck for 15 minutes to pamper your skin and make it smooth. • Prepare a homemade skin care recipe by adding a quarter teaspoon each of honey and lemon juice in a mixture of smashed strawberries and pineapple pulp. Here’s a video giving information on making a facial mask with pineapple, banana and egg white. • Blend three large chunks of fresh pineapple, two tablespoons of ground oatmeal, and one tablespoon each of honey and whipped cream. Apply this nourishing mask on face and neck and rinse it off with cold water after 15 minutes. • To lighten the complexion and get an even skin tone, regularly apply a combination of a beaten egg, pineapple juice, papaya juice, pumpkin juice, honey and a little lemon juice. Leave it on skin for 15-20 minutes and wash it off with warm water, followed by a splash of cold water. • Apply a pineapple juice and turmeric powder paste on the face and neck to fade dark under eye circles and clear skin. • Regularly rubbing fresh or canned pineapple pieces on skin for a couple of minutes can help heal acne scars and reduce signs of aging like wrinkles and fine lines. Moreover, the ascorbic acid present in its juice can cure blemishes naturally. • Prepare a homemade exfoliating mask by blending one cup of pineapple fruit and half a cup of papaya in a tablespoon of slightly warm organic honey. Applying this facial mask for 10-15 minutes shall make your skin glow and assist in clearing acne scars. Besides, you can enjoy eating this delicious fruit derive its beauty benefits. Moreover, it promotes digestion, lowers the risk of developing blood clots, and keeps your gums healthy. Pineapples are also considered good for brain.